Self-Guided Hut to Hut short trekking tour in the Mala Fatra is a great way to explore a less touristy, but still amazing hiking area at your own pace. All about the Self-Guided Trekking in Mala Fatra. 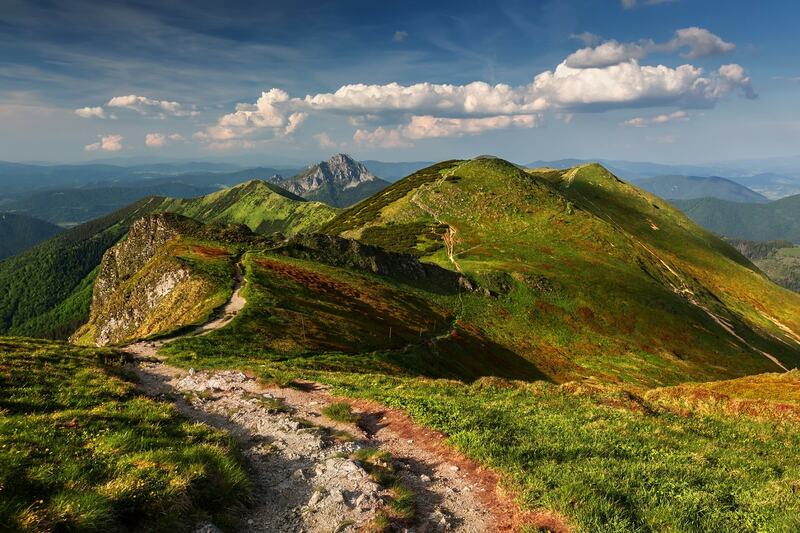 Would you like to explore and hike in a less touristy, but still beautiful, area of Slovakia? The High Tatras is not the only mountain range, where it is possible to do the hut to hut trek. You have probably never heard of the Mala Fatra mountains before. It is a small mountain range that you can walk from one side to another in a couple of days. And that´s exactly purpose of this tour – to walk across these mountains. You will spend most of the trek walking on the mountain ridge with the views all around you. The good (or bad?) news is, that the highest peak of the Mala Fatra, the Velky Krivan (1 709 m), is in the way. Don´t worry, once you reach the mountain ridge, the highest peak doesn´t seem to be so high anymore. Cozy mountain huts were built also in the Mala Fatra to accommodate tired hikers, who walk in good or bad weather and will be awaiting you on your way through the mountains. This short trekking tour is great for those who wants to escape the city and crowds. Majority of hikers come to the Mala Fatra during the weekends in summer. Otherwise, it is pretty empty and you will meet other hikers only occasionally. For this tour you need to be reasonably fit, as walking with the heavy backpack requires certain level of physical fitness. The hike on the last day involves also the elements of scrambling, so previous experience with scrambling is welcomed. We will arrange the accommodation at the mountain huts and give you detailed program for your tour. However you will pay at the mountain hut personally in cash for the accommodation. 2 nights cost 25 € per person. I recommend to do this tour from April to October. Tip: Walking with a heavy backpack is much easier with hiking poles, so I recommend you to get a pair. The first day begins in the village Strečno, which is situated below the famous Strečno castle. After you leave the village, you will pass a ruin of an old castle called Starhrad. On the first night, they will be expecting you to come at the Hut under the Suchy peak. You will walk to the hut through the dense forest, but at the hut you will have nice views into the valleys around. After an initial ascent you will finally reach the main ridge of the Mala Fatra and you will spend the most of the day walking there. Sometimes with the views all around and sometimes surrounded by dwarf pines. After conquering the highest peak you will start to descend to the overnight place – the highest situated mountain hut in the Mala Fatra. The second hut was built on a meadow above the forest in an altitude of 1 423 meters. After leaving the hut and initial ascent back to the mountain ridge you will see almost half of Slovakia. At least that´s my feeling when I always walk this path at the top of the ridge. Today you will come to the end of the mountain ridge and you will descend to the village Štefanová. During the trekking tour you will spend the night in the mountain huts. We always try to book the twin room, but it´s not always possible, as the mountain huts have only limited capacity. Some of them don´t even offer twin rooms, but only rooms for 4-8 people. That´s something, what you have to expect. When do we receive the detailed documentation?What clothes do we need to wear?Do we need any special gear/equipment? Do we need any special gear/equipment? No, you don´t need any special equipment, but walking with a heavy backpack is much easier, if you are using walking poles.